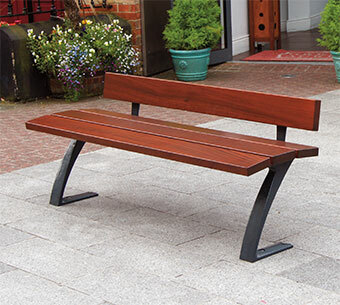 Timber and cast ductile iron seat with back support. Supports are manufactured from 10mm cast ductile iron which is more durable than cast iron. The ductile iron components are galvanised with powder coat finish, as we manufacture all our products in house we can arrange any colour combination you require, see our colour palette section on page 109. Timber slats are FSC approved mahogany 140 x 40mm treated with a protective wood stain coating. Surface mounted, there are 4 fixing points on the base for fitting to the ground by means of anchoring bolts. Recommended concrete foundation 1800 x 800 x 150mm. Recycled composite timber is also available as an alternative to hardwood.